Volkswagen's three-row crossover will be larger than even the long-wheelbase Tiguan. It's set to launch in the first quarter of 2017. 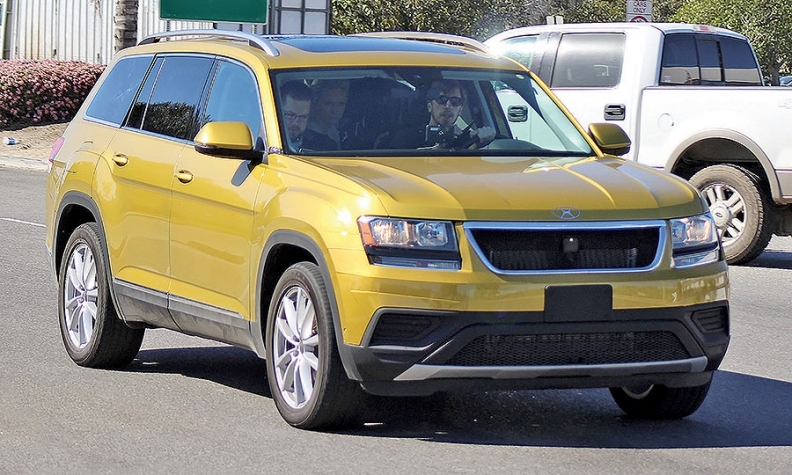 Spy photographers happened upon what appears to be Volkswagen's much-anticipated midsize crossover being put through its paces ahead of a U.S. launch in the first quarter of next year. The photos likely show a testing mule of the still-unnamed crossover on roads near VW's r&d center in Southern California. It's a three-row crossover that will be larger than the Tiguan -- even larger than the long-wheelbase Tiguan that arrives in the U.S. in the second quarter of 2017. Automotive News, along with a small group of U.S. media, saw the crossover's production sheet metal last spring at VW's design studio in Wolfsburg, Germany. The spied test vehicle's proportions and overall size, which VW has said is nearly 200 inches long and more than 78 inches wide, look like a match to the production model. So too is the creased beltline that rises atop the wheel arches. Yet much of the detail work is obscured in the spy photos. VW plans to begin assembling the midsize crossover at its plant in Chattanooga late this year.